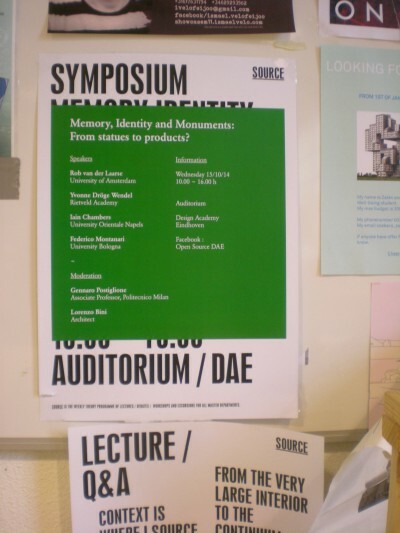 Instead of acknowledging the monument only as a fixed and consolidated typology, the symposium intends to discuss the power to recall memories and provoke thoughts – proper of monuments – into (designed) objects regardless of their size, value, exposure and durability. By reinterpreting their role that might not necessary be imagined as accessible by a community only but perhaps transferred to the context of people intimacy and privacy, it will also question the public nature of monuments. The Symposium is curated by Lorenzo Bini and Gennaro Postiglione, guest mentors at DAE-Contextual Design department. This entry was posted on Friday, October 10th, 2014 at 11:57 am	and is filed under lectures, news.